Since my only tools of drawing are pencil and ereaser I can only do this, sorry. 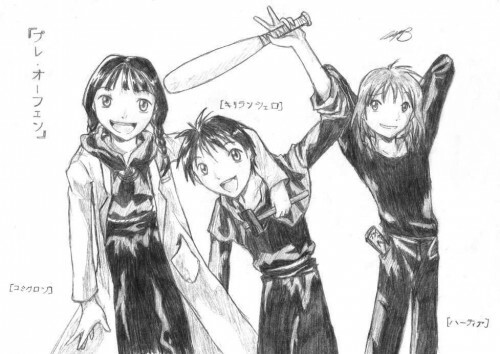 And for those who didn't know what I was talking about up there: this is an Orphen fanart. not bad, not bad. i haven't seen what they should look like but it looks like ur on the right track. think you can do better? i hear that if you keep drawing a series of pictures instead of working on one perfect picture then your skills will improve. Nice job! Details are done very well here. Sketchy, but good. Keep it up!